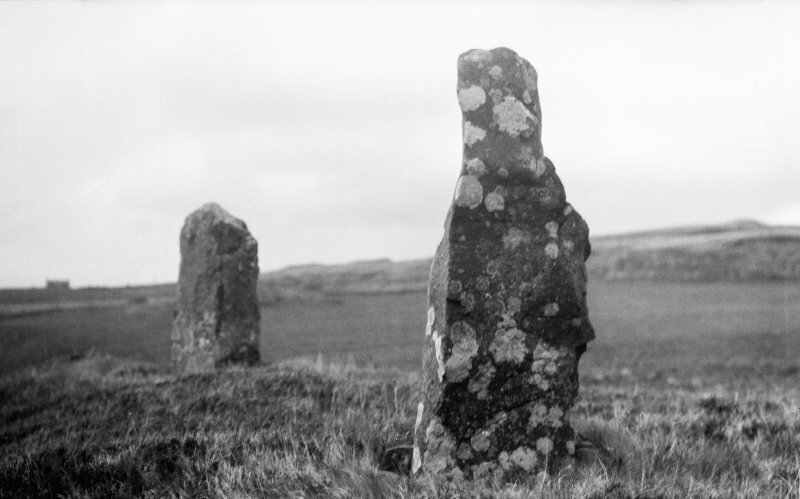 Standing stones, Sornaichean Coir Fhinn, the Glebe, Eyre. About 10ft from the edge of a bluff rising barely 20ft above the N shore of Loch Eyre ... are 2 standing stone 13ft 6ins apart, placed in a line NNW and SSE. The N stone, a four sided pillar, stands 5ft 6ins above ground and measures 7ft 8 ins in girth at the base, and the stone to the S, which is of irregular section is 5ft 8ins in height and 6ft lins in girth at its widest part about 2ft from the ground. It is said that there was once a third stone here. RCAHMS 1928, visited 20 May 1914. ....... three stones ...... each of them 3ft high. Two standing stores as described above: there is now no trace of a third stone. Visited by OS (A S P) 15 April 1961.